Hey baby girl. It’s your birthday! I cannot believe it has been four years since you were born. I can only imagine the party you are having in Heaven today. I have some friends who have babies up there with you now, and I know you are the best of angel friends. Today we went to the cemetery where you were buried. We brought you a balloon and a plant. Ava loves visiting you there. Today when we arrived we told her it was your birthday. She was so excited and kept saying, “Happy Birthday Sissy!”. She’s only 2 and a half but she’s so smart. I hope and pray that you can see these things from Heaven. She talks about you a lot and cannot walk by a photo of you without kissing it. A couple months ago she asked me if you were going to school with her. I’m not sure how to answer her questions, but I believe you are making yourself known to her. And for that I thank you. She loves you. This year you should be in Pre-K. I teach Pre-K. I’m not sure how I’ve made it through the first few days of school thinking about you and how you should be with these kids. They should know you, because you should be in their class. I find myself just observing them and wondering which one would be your best friend. And wondering what you would look like. I know you’d be so beautiful, smart and so sweet. I’ve started volunteering at the hospital with a support group for mommies and daddies who’ve lost their baby. I haven’t let your death be in vain. I’m using what I learned from it to help other people. And as much as I’m honored to be helping people, because I know how valuable that help is, I wish I didn’t know how to help them. I wish you were here instead and I could help people in ways related to other topics of a typical 4 year old. It’s been 4 years and your death is a part of me. I live with it. Life is good. But some days I cry for you. Some days I still get angry because you are gone. Days like today, I’ve done both. I could live for another 150 years and never understand why you had to die. I feel you though. I’ve written in the past about the signs you send me. The butterflies, the cardinals, the smells. I feel you baby girl. The 22 minutes you were here are forever etched into my soul. Every year on your birthday we have a birthday treat. This year Ava wanted cupcakes. So we had vanilla cupcakes for you. And every year on your birthday, daddy and I sit at the dining room table with all of the lights off. At 8:08, the time you were born, we light a candle between us and put it next to your picture. We leave it lit for 22 minutes. During those 22 minutes we talk about the night you were born and we sit in silence for you part of the time. At 8:30, the time you died, we blow it out. Those 22 minutes always go by so slowly. I wish the 22 minutes you were alive had passed that slowly. I love and miss you so very much. Please keep sending your signs to us. We cherish them. Happy Birthday-those are two words that are supposed to be, well, happy. They’re supposed to bring joy and blessings to whomever they are spoken. Birthdays are supposed to be something to get excited about. But, today, was not a very happy day. Sure, there were happy moments. We have a 17 month old running around that keeps us on our toes and keeps us laughing, keeps us going. But it brought so much sadness. We spent the day together, all three of us. We are both tremendously blessed with bosses that allowed us to have the day off of work, even me being a teacher, on the second day of school I was able to have today off. Our first ‘birthday festivity’ was a visit to the cemetery in Stone Mountain where Lauren is buried. We took pink carnations and spent a little time talking about her, and of course chasing Ava. 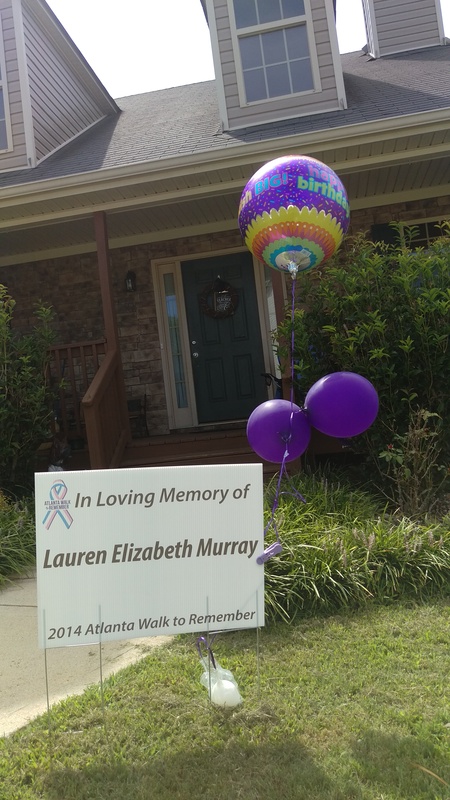 The next thing we did was place a sign in the yard that we got at the 2014 Walk to Remember, with purple birthday balloons from nanny and pawpaw. 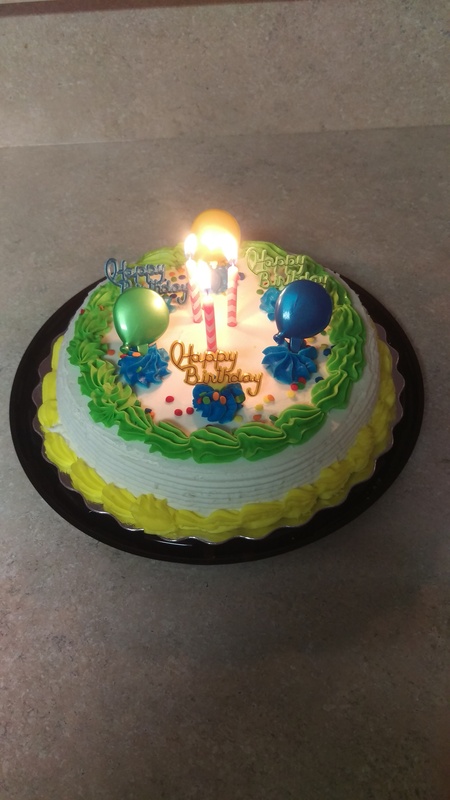 Later in the evening we had some birthday cake with three candles. 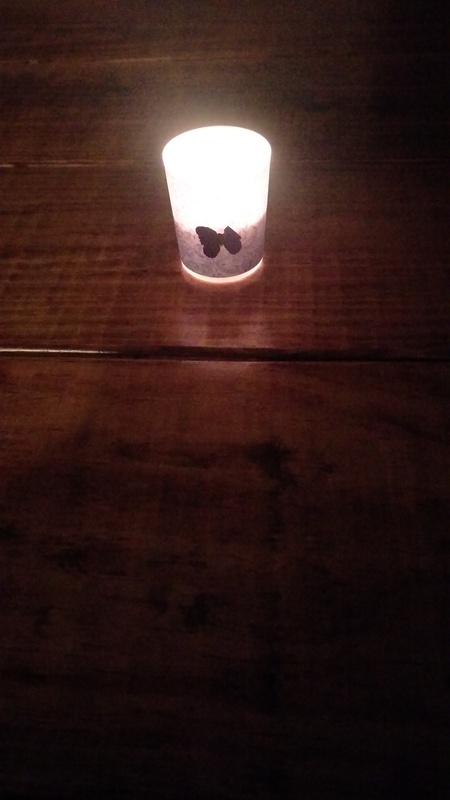 And at 8:08 PM, we lit a candle and cried, a lot. We spent the 22 minutes talking about the day she was born, and how our lives changed afterward. She was born at 8:08 PM. And the candle stayed lit until 8:30, the time she died. Something we will continue to do every year for the rest of our lives. 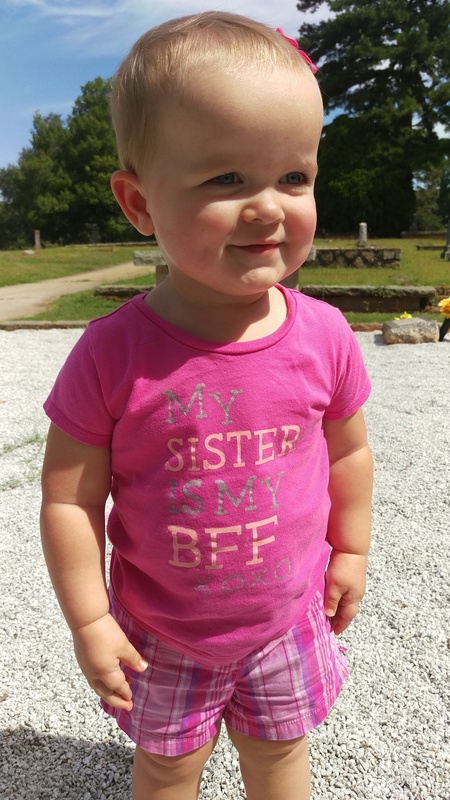 Ava wearing her “My sister is my BFF” shirt at the cemetery. It has been quite a while since I’ve been here. Well, since I’ve physically written here. In my head, I’m always here. But in life, I’m spending every possible moment with the most amazing 13 month old rainbow baby one could hope for. That’s right, I said 13 month old! 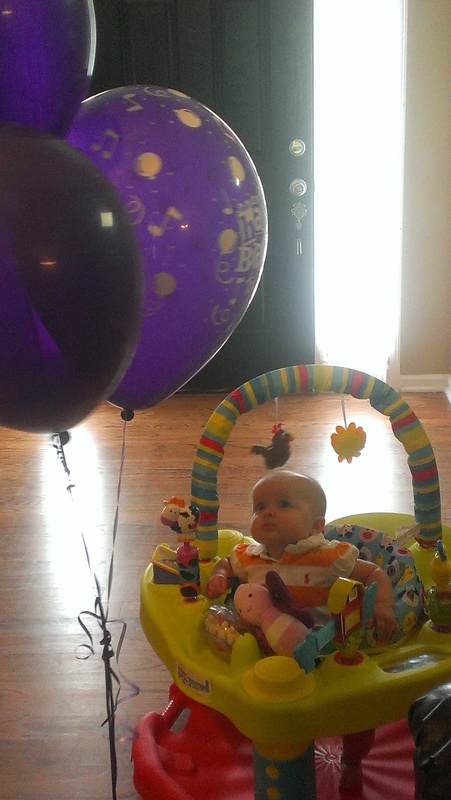 Ava turned one last month. Other than a couple of ear infections and a nasty case of RSV, she’s had a wonderful first year. She isn’t walking yet, but soon. And she has 6 teeth! Almost every night on the way to her bedroom we stop in the hall by Lauren’s picture and Ava kisses her goodnight. Heart melting to say the least. We celebrate every milestone she has, and I’m overjoyed and heartbroken all at once. I’m so happy for what she’s accomplished and how smart she is. But always, somewhere in my mind, I can’t stop myself from being sad that we never had those moments with Lauren. And never will. My husband and I had a discussion about this a couple days ago, and a fellow mommy to a rainbow recently wrote about it in her blog. For us, it is a constant balancing act. Don’t leave Lauren out, but don’t let Ava grow up in the shadow of her sister. Teach Ava all about Lauren, but don’t make her feel any less important or less loved. I guess this will be a lifetime task. And another thing that I know will never go away is the pain I feel over the decision we made at Lauren’s death. I’ve written before about the choice we made about her body. We chose not to cremate her, or bury her. We opted for the hospital disposition. This is my biggest regret in life. Period. I’ll never get over it. Upon receipt of her death certificate, we learned that her body was turned over to a crematory, and she was cremated. So does this mean she was cremated and her ashes were just thrown away? I feel like I threw her away. I’d give anything if we would have chosen to bury her, or cremate her and keep her ashes ourselves. It kills me. For this reason, I can’t go to the funeral home or to memorial services unless it is for someone I obviously have to be there for. I can’t be there, it brings all of the emotions back of Lauren’s death, and the emotions and regret of what I wish we’d done differently. I wish we’d made a different decision. I wish I could go visit my baby at the cemetery, or have a her ashes in my home to hold whenever I wanted. But I have neither. There are other things that happen, things I wonder, ”when will this stop?”. I’d say about 90% of the time when I find out someone is pregnant, I still get that sick feeling in my gut. Maybe it is not jealousy, as I often think of it, but maybe it is fear for this mommy who might not know what all can go wrong. But with that being said, I guess it could be jealousy. Jealousy over the happy go lucky feelings of a first pregnancy when the mother is blind to what all is possible and gets to enjoy the whole pregnancy without wondering if her baby will die. (Enjoy it at least when she’s not complaining about the miracle that is taking place in her body). Another thing I wonder about if it will ever stop is the anger I feel when people complain about their pregnancy or their kids. No one makes you make the decision to get pregnant and have kids. It is a blessing. Enjoy it and stop making it sound like a death sentence. Here we are, less than a week before Christmas. Another (of many) Christmas’ with out our sweet Lauren. We are all finished with our shopping and because Ava is so young and doesn’t understand, all the gifts are under the tree and the stockings are stuffed. But last night I was re-positioning them and looked at my husband and expressed what a pitiful, sad sight it was. Three of the stocking are hanging heavily on their hooks, but Lauren’s is empty. It broke my heart, and still does. He said we’d put something in it. I’m not sure what you put in the stocking of your dead child. I suppose we could write letters to her. It’s been almost twenty nine months since she left us and there are still times I feel like it was yesterday. And on the other hand it feels like a lifetime since I’ve held her in my arms. On a very positive note, we have Ava this year for her first Christmas! And let me tell you, this child is a gift straight from the hand of God. We’ve had so much fun this Christmas season shopping and wrapping for her. Dressing her in cute clothes, taking her to see Santa (who she hates), and looking at all the lights. She’s starting to scoot and army crawl all over the place and can’t be left alone! I’ve ‘caught’ her under the tree twice exploring the gifts. She’s our precious little rainbow and I can’t express how thankful we are for her. We’ve started a new thing with her. In the hallway on the way to her room is hanging a grouping of photos of Lauren. Either on the way to bed, or in the mornings on the way out of her room, sometimes both, we’ll stop and say, ‘there’s you sweet sister’, and Ava will lean over and kiss her! The first time she did it it brought tears to my eyes. And because Ava speaks baby language of repeating the same two sounds over and over (bye bye and da da so far) we’ve started calling Lauren Lo Lo. Our Ava is starting to learn about her sister in this way and will continue to do so as she gets older. So it’s been 48 hours since we found out that I did indeed have a miscarriage. I’ve had a lot of time to think this weekend. And a lot of time to remember. I’ve been remembering the raging emotions that consumed us after Lauren died. It’s all been rushing back. I have a dear friend who has had several miscarriages as well as a late term birth and death like we did. She told me earlier today that it doesn’t matter if a pregnancy was planned or not, it’s still your baby. Your baby just died. I know that because that is exactly how I feel right now. Another one of my babies just died. Yes I was at a very early gestation, but it was still my baby. And that train of thought made me think about this: people who are pro-life (like me) believe that there is a baby present at the time of conception and an abortion at any gestation is murder and that it is never ok to have an abortion because it is the killing of a live baby. Well, if that is true (which I strongly believe it is) then why is my miscarriage at an early gestation just something to shrug off as if its ‘just one of those things’? It was our baby. We’ll never know the gender but I had a positive pregnancy test which means I had another life in me. It is a big deal to us. We are grieving the loss of a life that we created. My sweet Lauren is always on my mind. But the past few days I’ve been consumed with thoughts of her. I was recently in a situation where I spent some time with a group of children whose birthdays are August and September of 2012. 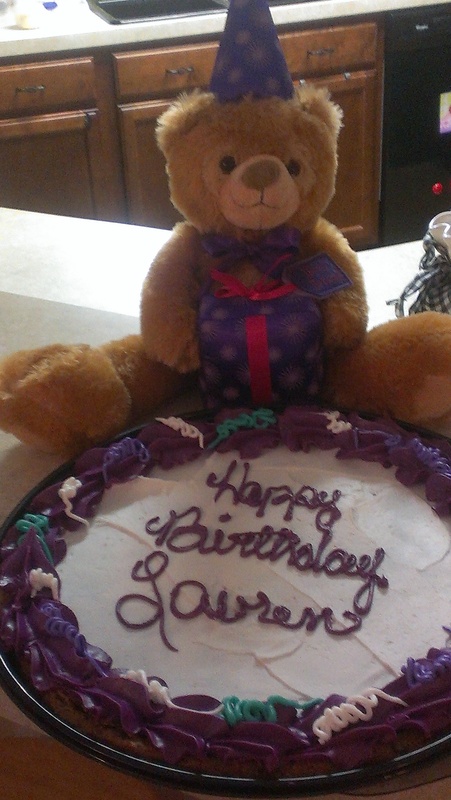 Lauren was born in August 2012. I sat staring at these children in awe. Two years old. My daughter should be two years old. I stared at their features, their sizes, their clothes, and their eyes…mostly their eyes. They were all so perfect. I found myself wondering if their parents had any idea how lucky they are. I started to feel jealous. I quickly put those thoughts out of my mind and returned to observing these tiny beings. Lauren should have those short, stubby fingers that fumble around until they can grasp the toy perfectly. She should have those stout legs that aren’t perfectly coordinating together. She should have those cure 2T clothes with matching hair bows. She should also have those sweet, innocent eyes. She should be looking at me with all the curiosity in the world. I wanted to pick these kids up one by one and hug them close. Love on them they way I’ve wanted to love on my daughter for so long now. But I know it would fill the emptiness. Nothing can ever fill it. It is the empty part of my heart that will always have her name on it. No matter how many siblings she has that I love like crazy or how happy they make me, one part of my heart will always belong to her and it will always feel pretty empty. Because my sweet Lauren, you should be here. I love you baby girl. So here I am, a mother of two beautiful daughters. One I get to hold in my arms everyday and watch her grow. One, I only have images in my head and feelings in my heart and soul. In my bones really. That’s how deep it hurts. We’re coming up on 2 years since Lauren was born and died. 2 years. And now our second baby girl is already 4 months old. Anyone who is a mother (well good, decent, loving mother) can attest to the love you feel for your baby. It’s a love that simply cannot be described. I look at my baby girl and I listen to her laugh, and see her smile when she sees my face and I tell her that no mother in the world has ever, ever loved their baby as much as I love her. That’s how I feel. So then imagine that much happiness and love, and turn it around. That’s how much I hurt at the exact same time. I miss Lauren so much. Just the other night after a seemingly perfect day my husband and I went to bed and fell asleep. About 20 minutes later I woke both of us sobbing uncontrollably. He was of course alarmed and concerned. He kept asking me what was wrong and all I could say was, “I just want to hold her one more time”. I want to hold her, smell her, kiss her, and bring her back. I’m greedy. I have a perfect little girl here with me, but I want both of my girls here. I’ll never understand why I can’t have that. Never. The other night when that happened I felt like it was August 4, 2012, the day she was born and died. Usually I just cry sorrowful, sad tears and can pull myself together. But this was the same cry from that day. It was laced with sadness, anger, confusion, bitterness, disbelief, and longing. I felt like I’d just lost her. The proverbial ‘they’ say that time will ease the pain. That is a lie. Of course some days are easier than others. But the pain is raw. Its there. All of the time. Every time my daughter does something new I think about how we missed all of that with Lauren. I’m so thankful we have our second daughter here with us. Without her bringing so much happiness to us everyday I don’t think I could have handled the pain this long. To any of my friends reading this who are still waiting on your rainbow baby or have been told that it will never happen, for what its worth, I’m praying for you, thinking about you, and remembering your baby every single day! Ok, so I know it has been way too long since I’ve been here. I’ve been too busy enjoying our sweet little Rainbow Baby, Ava! I am truly amazed every time I look at her (which is all the time!). While we are so happy and know how blessed we are to have been able to bring her home with us almost 3 months ago, there so still so many painful moments that belong only to a parent who has lost a child. I’d never expect that pain to go away, because that pain is centered around a beautiful love. I miss and love my firstborn as much as I enjoy and love my second. Every little milestone Ava reaches, I can’t help but think about how we never got to experience these things with Lauren. If I could see her now I’d tell her how much I miss her and how much I miss the things that can’t happen. Although they never happened, not being able to do them leaves a huge void. And while Ava brings so much joy to my life, more than I could ever begin to explain, she can never replace her sister. If I could see Lauren now I’d also tell her thank you. I’d tell her thank you for preparing my heart to be capable of a love bigger, deeper, wider, and stronger than I ever thought possible. Of course I wish I had her back, but I honestly think that the love you feel for your rainbow baby is stronger than any love any other parent could feel. It’s because I know what not having my baby feels like, what losing her feels like. And I’d tell her thank you for helping God pick out and safely send us the perfect little sister for her! Ava is a happy baby that loves to laugh and smile! She looks just like her daddy and has the sleeping habits of her mommy! (she loves her sleep) 🙂 So my dear sweet Lauren, thank you, I love you and I miss you!! Our rainbow baby is here!! Ava Noelle was born on 3/3/14 at 7:59 AM. She weighs 5 lbs 12 oz and is 18.5 inches long. 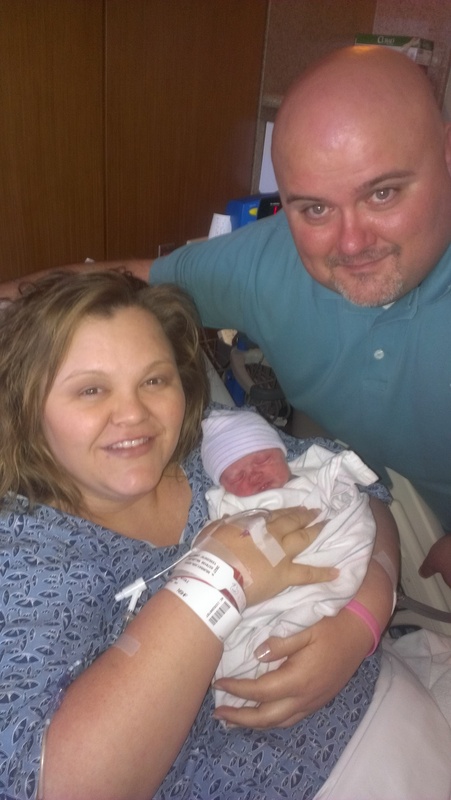 We are so blessed and completely in love with our newest daughter!! Well, I can’t believe I’m saying this but our c-section is scheduled for tomorrow morning! I’m so thankful that we have had a healthy pregnancy and the baby looks great! Lauren’s little sister will be here tomorrow! Thank you to everyone for all of the sweet, positive comments and prayers. They’ve brought us to 37 weeks and will get us through tomorrow, too. I can’t wait to share the next part of our journey with all of my blog readers! God bless! So as of yesterday, we officially made it 10 weeks longer in this pregnancy than we did with Lauren. 34 weeks 2 days was a huge accomplishment for us! So thankful for every second I’m still pregnant with this sweet girl. And I must say, we are also so thankful for all of the doctors and nurses we’ve encountered on this journey thus far. They have all been so compassionate about our loss. They congratulate us on making it this far and never forget about our precious first born who is no longer with us. Here’s a pregnancy update. The 34 week 2 day ultrasound estimated our girl weighing 5 lbs 4 oz, she has cute chubby cheeks, and long legs! She’s incredibly active in my belly, constantly assuring me that she’s still growing, getting ready to meet us. While it has been a mostly uneventful pregnancy, we had a scare last week. I was in my OB’s office for a regularly scheduled non stress test. My BP was 150/100. Of course I immediately stared crying and thinking, ‘here we go again’. The doctor sent me over to labor and delivery for tests and monitoring. Thankfully, all the blood work related to pre eclampsia/HELLP testing came back negative. And within a couple of hours my blood pressure returned to almost normal. I got to come home the same night with orders to keep a close eye on my blood pressure and to limit activity. So far so good. I’m still waiting on the results of a 24 hour urine test I did after leaving the hospital. The specialist told us yesterday that 30% of women who are preeclamptic will have no BP issues and the rapid results of the urine dip test will be negative for protein, with the protein showing up in the 24 hour collection. Still holding our breath on those results but staying hopeful and thankful for the health I’ve had this far! I can’t believe it has been almost a month since I’ve blogged. So much going on in preparation for the baby. But I also have so much on my mind that I’m not even sure where to begin. First of all…a quick pregnancy update for those of you who are following along. I’m 31 weeks 3 days today. Lauren’s little sister is measuring 4 pounds 1 ounce, has very long legs, and a little bit of hair can be seen on the ultrasound. As for me, no signs of pre-eclampsia or HELLP and other than typical 3rd trimester fatigue I’m feeling great. My c-section is scheduled for Monday, March 3rd, at which time I’ll be 37 weeks 2 days. Keep those prayers coming. We recently had our baby shower, which was beautiful. We received so many great gifts. But I’d be telling a lie if I told you I wasn’t worried the whole time. In the back of my mind I just kept thinking, “I really hope we get to use all of this stuff”. Yes, I’m at a gestation that birth would be premature and our daughter would spend some time in the NICU, but statistically speaking, she’d survive. But once you’ve lost a child, you can never really get rid of that fear. I know people who’ve had perfectly healthy pregnancies only to have to say goodbye to their baby at the very end, for reasons that still remain a mystery. I’m not being little in faith, I’m living in the real world. The same world I was living in when our first daughter died. The world in which bad things happen to good people. I get those same anxious feelings and have those same thoughts as each additional piece of our nursery comes together. I want to relax and enjoy the last 6 weeks of my pregnancy, which I think I’m doing for the most part, I just can’t completely get rid of those thoughts. As excited as we are to meet our newest addition, it brings back so many of the raw emotions we associate with losing Lauren. Every time we’ve reached a milestone past 24 weeks (when we lost her) I think to myself and my husband and I talk about how we never got to do those things with/for her. A lot of tears have been shed, feeling happy and sad at the same time. Happy that the baby and I are doing so well and we’ve made it this far, but sad that we missed out on so much with our sweet Lauren. I feel that some people are forgetting Lauren. They focus so much on the joys of this pregnancy and seem to forget that we are already parents to one beautiful angel in Heaven. No, we never changed her diapers, brought her home, or countless other things, but she’s still our daughter and we’re still her parents. I feel that they aren’t only forgetting her, but forgetting the pain that we live with everyday. The joy and happiness of this pregnancy and this baby doesn’t erase anything from the past. That being said, there are some people who I am convinced will never forget her. Her name is never far from the lips of my parents and we talk about her often. Also, we received a great gift bag full of baby stuff from a friend from my husbands work. Among those gifts was an outfit for the baby that says “little sister”. 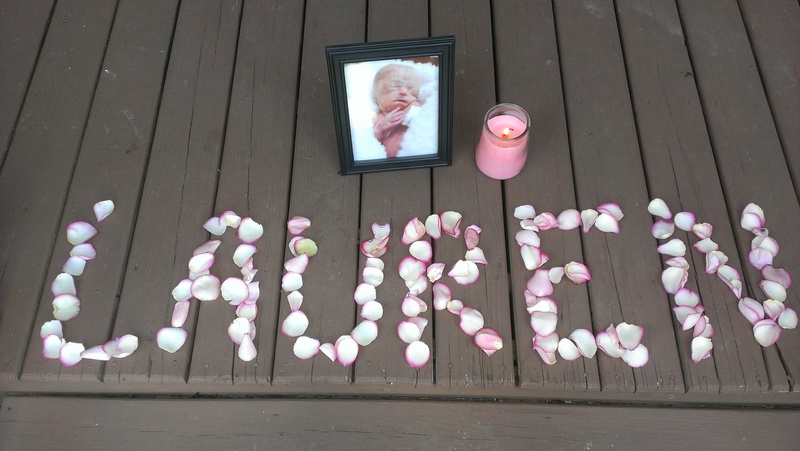 It melted my heart and brought tears to my eyes to know that someone remembers and acknowledges Lauren 17 months after her death even amidst all of the excitement about the new baby coming. For the second time, we just celebrated Christmas without our Lauren. I can say that it wasn’t as miserable as the first. In time you do learn to deal with this absence a little better. Easier, not at all. We just learn to control our tears and have a new function, a function that allows us to cope with the pain. It’s like we’ve started figuring out where to put it, if that’s even possible. Lauren’s stocking was empty again this year. A heartbreaking thing to see. Pictures of her all around our home, but no presents for her under the tree. My husband suggested that next year we start a new tradition of putting something in her stocking from us and from her baby sister. We can’t wait to tell her sister all about her. We certainly had our moments, just between the two of us, where we lost control of our emotions and melted down feeling her absence. We feel it everyday but Christmas and other holidays seem to intensify it about a million times. She’s supposed to be here celebrating with us. I get the feeling from some people that because we’re pregnant again the loss hurts less. Let me just say, it doesn’t. Every time on Christmas day I heard a parent complain about how tired they were from shopping, wrapping, and waking up early to watch their children open presents I just wanted to yell. I’d love to be in those shoes. I’d love to have been worn out from shopping for and wrapping presents for Lauren, but I wasn’t. Those things didn’t hurt any less just because I’m pregnant again. We miss her still and always will. Feeling so hopeful today! 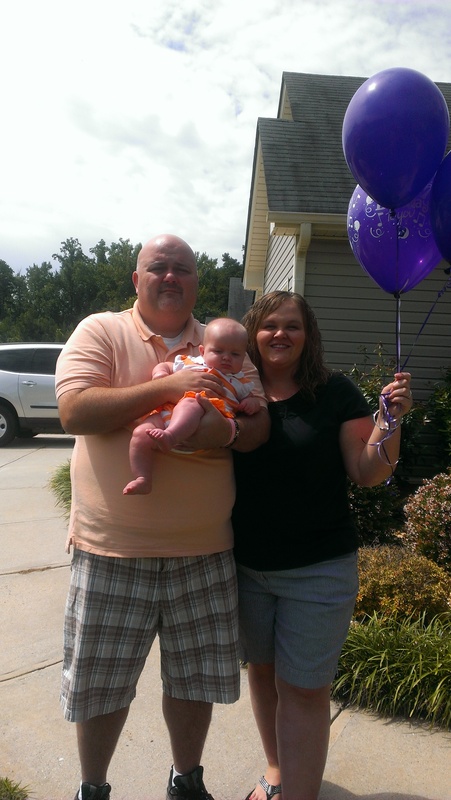 Lauren was born at 24 weeks 2 days because of Preeclmapsia/HELLP syndrome weighing only 12 oz. Well today I am 24 weeks 2 days with our second precious daughter. We had an ultrasound this morning. She weighs about a 1lb 8oz and everything looks great with her and me! Hubby and I were both holding our breath this morning before the appointment and didn’t really let it out until the tech told us how much the baby weighed. Although the big sigh of relief won’t come until we’re holding this little lady in our arms and she’s healthy, every milestone in the pregnancy helps us relax a little more. Only 12-13 more weeks since they say we’ll be scheduled at 36-37 weeks! Thankful for good doctors…pregnancy update. My husband and I are more and more thankful after each visit to see either my regular OB or the specialist. After the experience we had with Lauren and the specialist we saw with her, we had a bad taste in our mouth about the medical part of it all. We love the OB that I see and are thankful that he is still my doctor. We are seeing a new perinatal specialist this time and the difference is mind blowing. I feel like everyone there pays attention to the smallest details and they tell me everything that is going on, rather than making me ask all of the questions. So far everything looks great with baby and me. We had an appointment a couple days ago with the regular OB group. Not the doctor that delivered Lauren but another in the group. He spent several minutes looking through my file and told us that we’re lucky I’m still here. He checked me over and said that everything looks good and he honestly thinks that nothing is going to happen as far as preeclampsia or HELLP. Of course that’s not a guarantee, but we’re praying he’s right! What’s crazy to me is that right now, at 20 weeks, this baby is already bigger than Lauren was at 24 weeks. She’s actually on the bigger side for this gestation and has consistently measured so. Staying positive and very hopeful that we’ll make it to at least 36 weeks! The doctor said that we’d probably schedule the c-section for 36 or 37 weeks, it’ll just depend on her size and we’ll have to consider that along with the risk of uterine rupture because my c-section with Lauren was a classical, which increases this risk. We are so blessed to have so many people praying for the 3 of us! Holding babies, explaining how I feel, of course you don’t understand! I’m so confused by something. Many times I, or other parents who have lost a child, express certain emotions or bravely tell people that something bothers them or they aren’t comfortable with a situation. And they are often met with a reaction of disbelief or the person they tell will say, “Well that doesn’t make sense to me” or “ I don’t understand why you would feel that way.” These people often also try to give advice. OF COURSE YOU DON’T UNDERSTAND!! Your baby didn’t die! I hope you never do have to understand how I feel. And as for advice, just stop. You have never been in our shoes and you can’t even begin to tell me anything that would be useful. Every grieving parent has the right to handle situations however they want, whatever makes them comfortable. And here’s another personal one that bothers me. When I’m upset or discouraged people constantly tell me to pray. If you think you have to remind me to pray, then you don’t know me very well. Without the power of prayer and the grace of my God, I wouldn’t be functioning. So yeah, I pray. I was curious to know if an emotion I was having was common among other parents who have lost a baby. So I asked a few other moms and found that I’m not alone in feeling like this. The feeling is that I refuse to hold a baby. The last baby I held was my daughter. Her lifeless little body was still in my arms and I couldn’t do a thing about it. It’s been a little over 14 months since we lost her. 14 months since I held a baby. And I’m 17 weeks along in another pregnancy and couldn’t be more ready to meet this little lady. But I cannot or do not want to hold or be around someone else’s baby. It hurts too much. Maybe it is selfish for me to say that the last baby I held was Lauren and the next one I hold will be the one growing inside me. But if people think that’s selfish, I don’t care. It’s the way I feel and I won’t be put in a situation where I have to be around or hold someone else’s baby. Does this mean I don’t like babies? Of course not! Does it mean that I’m not happy for my friends who have beautiful little infants? No way! I’m very happy for them and enjoy seeing the pictures of their children. I just simply am not comfortable being around or holding them. I’m sure there are people reading this right now that think I’m crazy, selfish, unreasonable, etc. I’m also sure that the people thinking those things have never lost a baby. It honestly think it is absolutely ridiculous that I have to try to explain or justify my feelings on this or any other matter concerning the loss of our sweet daughter.